The Z-NET Blueprint sets out a simple logic for communities across Australia to establish a least-cost approach to becoming a Z-NET. Becoming Z-NET is technically possible today with available technology, however in practice cost is a key consideration for most if not all participants. To establish the case for action, the community needs to weigh up the benefits and the costs of options available, such as using less energy for things like lighting and hot water, and compare these to other possible options. The Z-NET Blueprint’s ‘least cost logic’ ensures that actions that have the most benefits or least cost are taken first. The Blueprint also recognises that benefits and costs of renewable energy options change over time. Recognising this allows a community to take practical action immediately whilst resolving the most appropriate long-term investment to reach the Z-NET goal. The following is an overview of the assessment approach applied to each of the possible options to achieve zero net energy, such as energy efficient appliances, solar PV and improved firewood resource management. Each option has characteristics that determine whether it will suit a local context and contribute to the Z-NET goal. » What is the technology or energy resource and what are its characteristics? » What is the local context that the option responds to? » What impact on the goal of zero net energy can this option have? 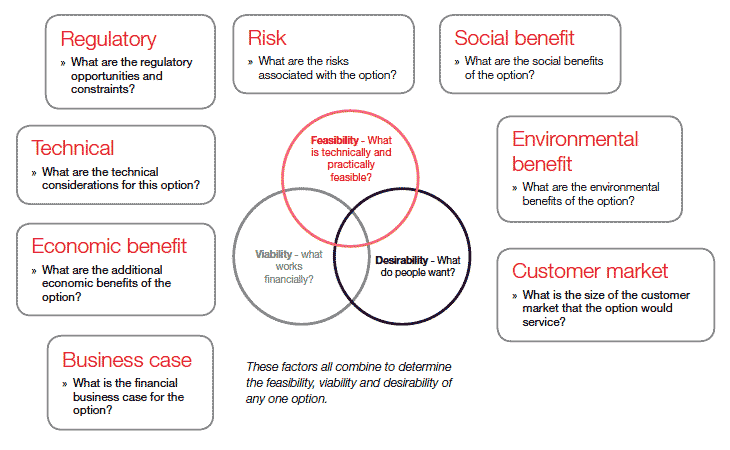 A number of factors need to be considered in order to evaluate technology and resource options. Z-NET Blueprint is now available.